Dalka Industries was a manufacturer based in Victoria, Australia. 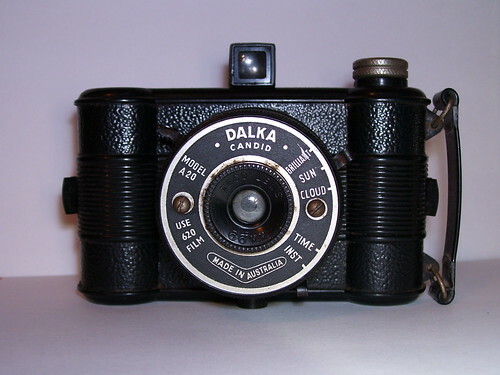 Dalka is known for one camera product, circa 1949-53, the Dalka Candid Model A20. Its ribbed styling is reminiscent of some Falcon Miniature versions from Utility Manufacturing Company; yet it differs in being designed for 6×6 cm exposures on 620 film, rather than 127. Its 66mm Teco Lens does not focus; and exposure can only be adjusted via three "weather condition" aperture stops, or through switching the shutter from "Inst" to "Time." McKeown's notes that the interior of the plastic body is molded with the instruction "use 620 or 120 film," yet 120 spools are in reality too large to fit. The faceplate of the camera correctly specifies "Use 620 film." ↑ For example, compare with this Falcon Miniature posted to Flickr by [Gustavo Vasquez http://www.flickr.com/photos/eskimogus/]. ↑ McKeown, James M. and Joan C. McKeown's Price Guide to Antique and Classic Cameras, 12th Edition, 2005-2006. USA, Centennial Photo Service, 2004. ISBN 0-931838-40-1 (hardcover). ISBN 0-931838-41-X (softcover). Page 240. This page was last edited on 7 August 2011, at 15:40.